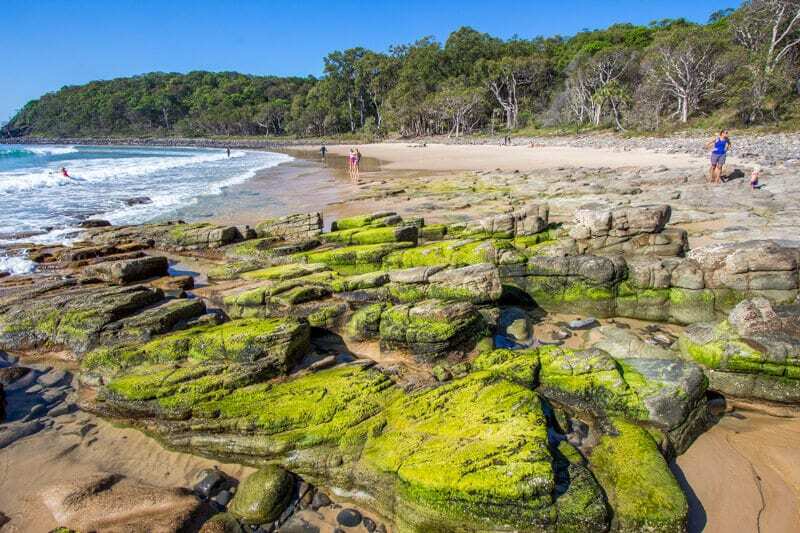 Any region in Australia that incorporates the word coast will have a bounty of beaches to enjoy – the Sunshine Coast in Queensland has some of the best! We visited almost every coastal region during our trip around Australia but I don’t recall many having “award winning” beaches. 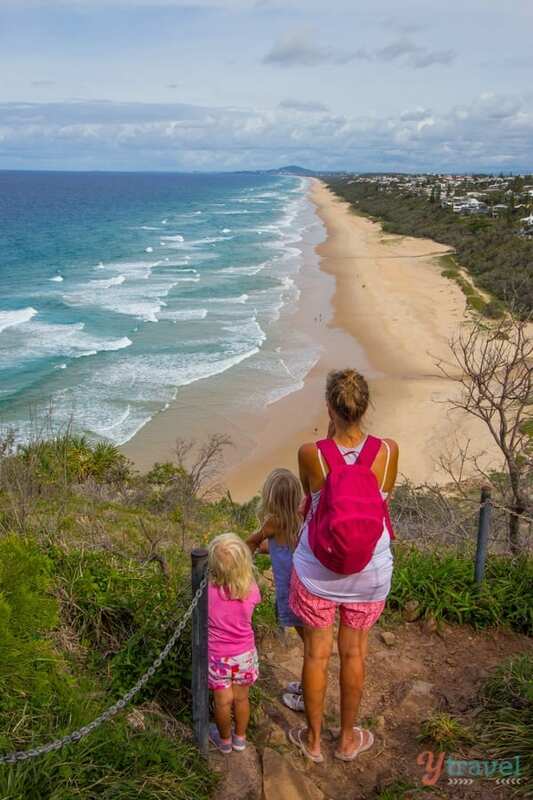 The Sunshine Coast has four beaches in the Top 10 list for most family friendly and safest in Queensland chosen by Surf Life Saving Queensland. But it’s not only golden sands and rolling whitewash that offer you a water wonderland on the Sunshine Coast; there are plenty of waterways and rivers to float your boat too! 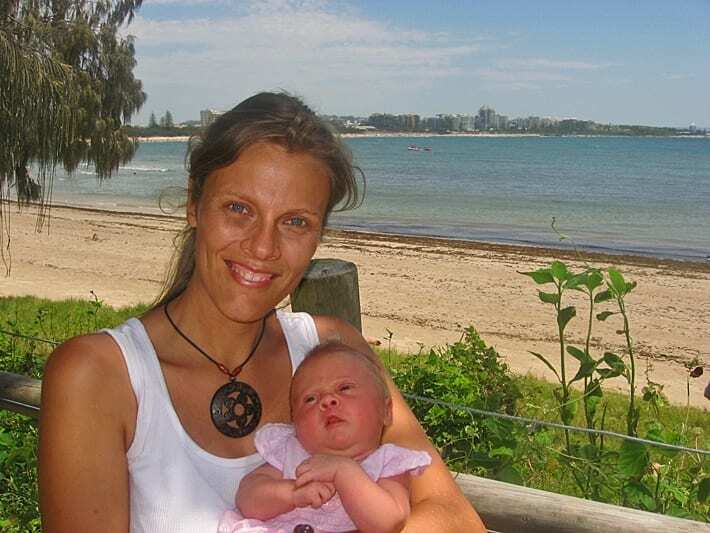 Kalyra is a true blue Sunny Coaster, born in Nambour Hospital, and spent the first nine months of her life getting to know Mooloolaba Beach. 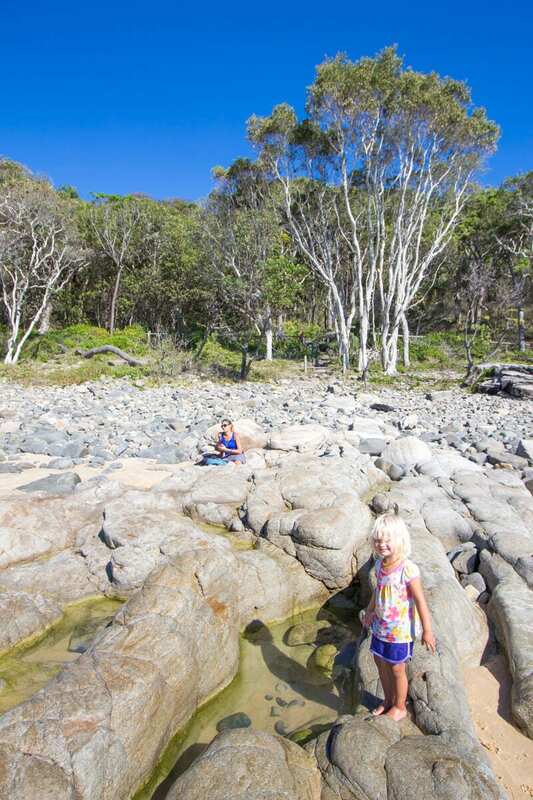 You know how hectic those times in a young mother’s life are, so I can’t say we explored much else of the Sunshine Coast in Queensland when we lived here. It’s been nice to experience Kalyra’s birthplace with her extensively. Exploring the Sunshine Coast has been one of the greatest beach vacations ever! 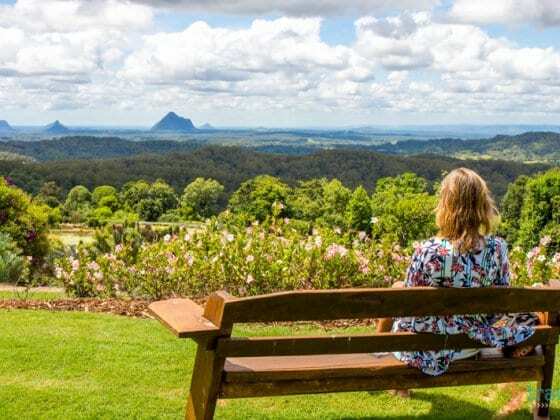 Allow us to share with you the fun and adventurous region we’ve discovered, through our travels and some in partnership with Visit Sunshine Coast. 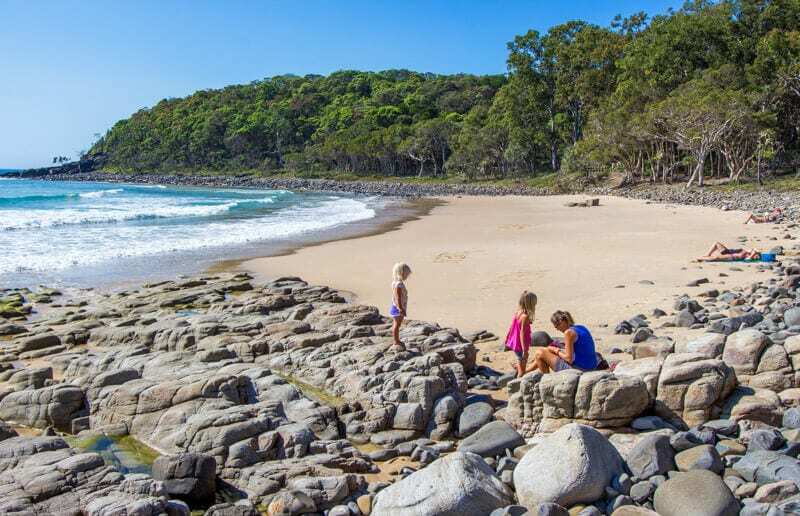 In this post we share what we love about the following Sunshine Coast beach towns. Stay tuned, because next month we’ll be moving away from the coast to showcase the fun you can experience on the Sunshine Coast out of the waves, in one of Australia’s most stunning hinterland regions! Let’s start with our old home town situated in the middle of the Sunshine Coast region. 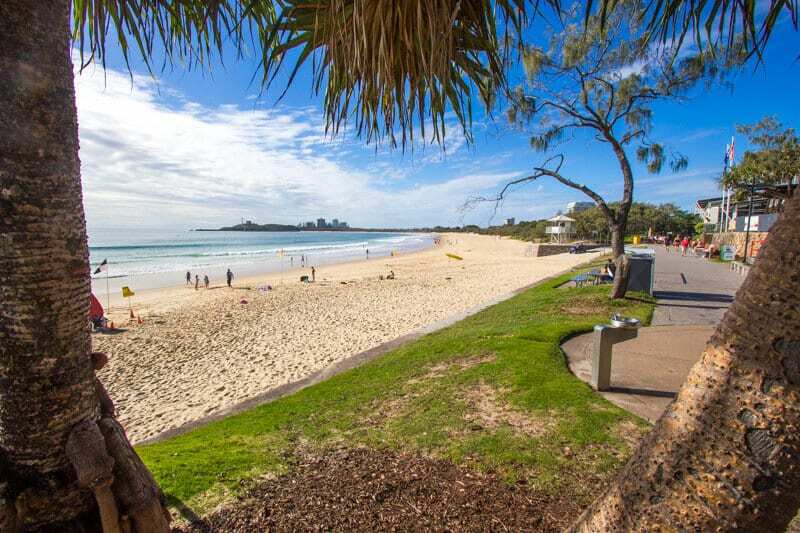 Mooloolaba Beach is patrolled seven days a week so is the most popular spot for swimming and the place to meet with friends and family for coffee, picnics or BBQ’s. 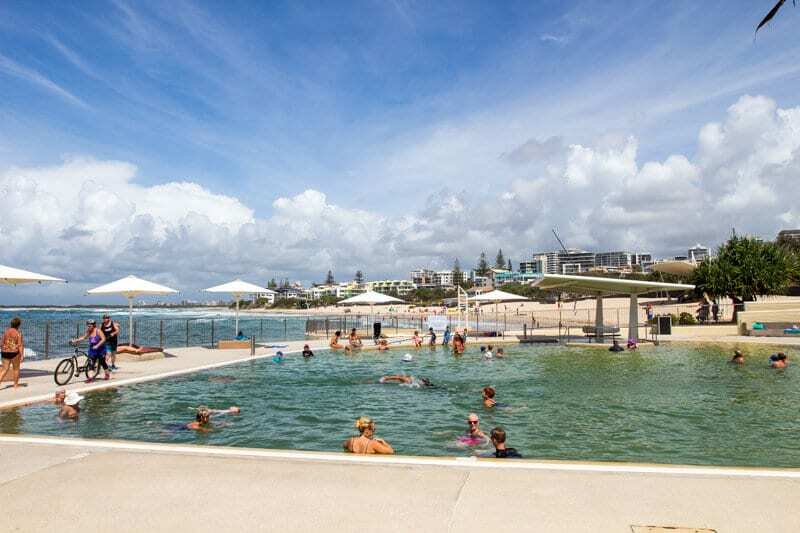 It made the Top 10 Safest Beaches in Queensland list and there’s a beautiful shaded BBQ grassed area to relax, right next to the kids’ playground, and across the road from many restaurants and cafes. The Mooloolaba Surf Club sits right on the sands of the beach. 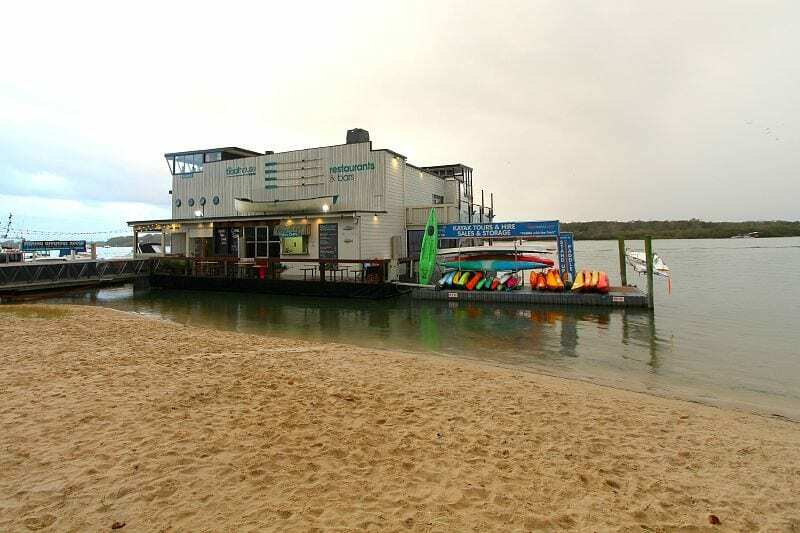 It’s one of our favourite surf clubs in Australia, especially when sitting on the deck on a warm Saturday afternoon, with the windows open, the breeze blowing, the sun setting and some acoustic music playing! 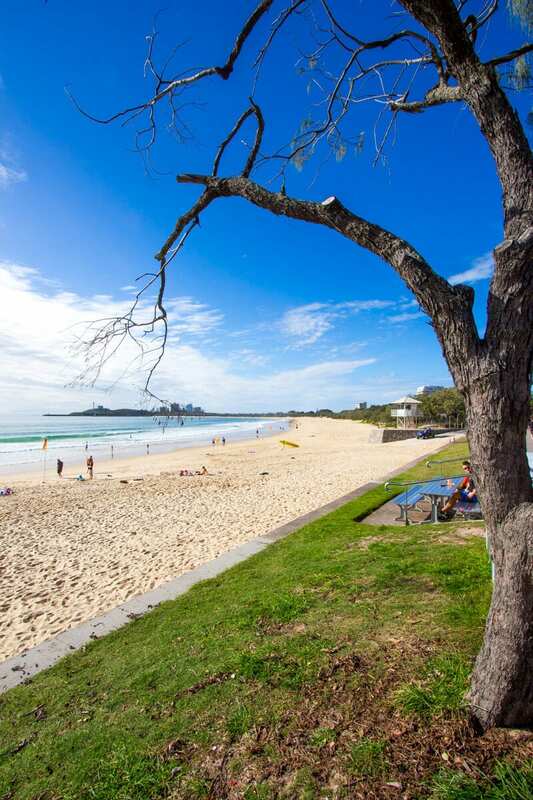 Alex Headland is just north of Mooloolaba Beach and is known for its surfing break right on the headland. I feel Mooloolaba is better for kids and swimming, but Alex is the spot for surfers. There’s also a skate park and playground here. You can also walk along the path from Alex to Cotton Tree at the Southern end of Maroochydore and beside the Maroochy River. 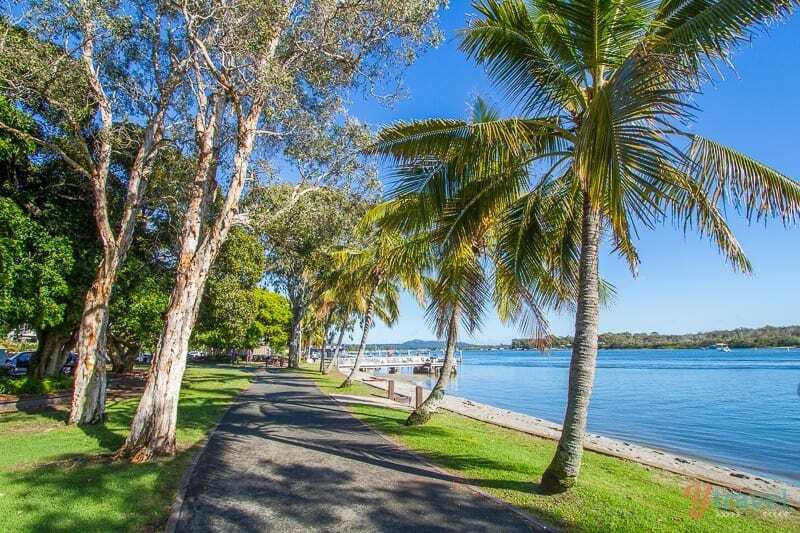 The twisted branches and large round leaves of the native cotton trees provide plenty of shade along the Maroochy River – the perfect, calm place for water sports. Cotton Tree has a cool, relaxed local vibe. This coastal walk takes about 90 minutes return and was my daily morning walk with Kalyra when she was a baby. 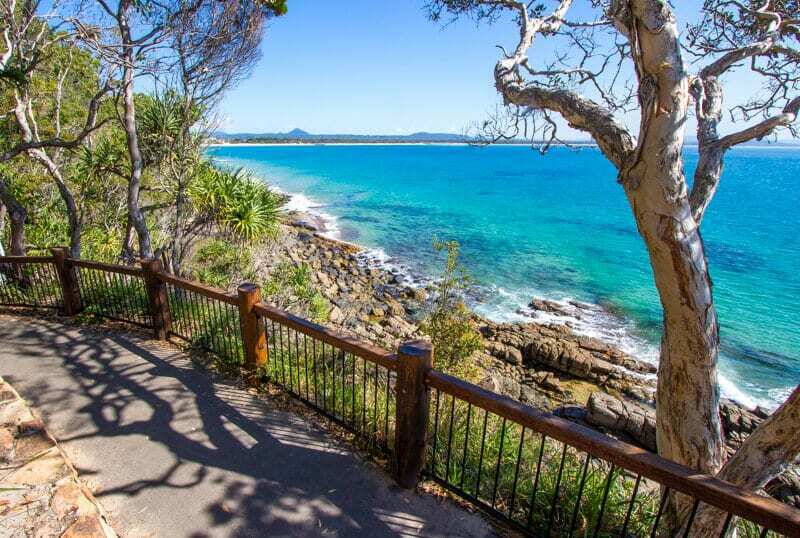 Start from surfers point and walk along the headland (picnics and panoramic views) into Mooloolaba and alongside The Esplanade, which is known as one of Queensland’s best for al fresco dining or café bumming with stunning views of the ocean. A short boardwalk takes you through the dune forest to Point Cartwright. Branches overhang, wild turkeys heckle past looking for food and other animals can be heard scurrying through the bushes. There are plenty of chairs to sit and rest and access tracks down to the beach for a swim. Just near the end of the walk is the Spit, which has a large grassed area popular for picnics. This area is my preferred place for swimming, especially with kids – although it’s not patrolled. It’s calm, quiet and clear and you’re bound to see lots of fish swimming around you so bring your snorkels! Locals love to do laps up here early in the morning and it’s a great spot for kayaking. At the end of the walk is Mooloolaba Point and lighthouse. Hang around for sunset and watch the fishing trawlers come in with their fresh catches of the day and then have some for dinner in one of the seafood restaurants in the wharf area – they are famous for freshness. Mooloolaba Fisheries on the Spit has some of the best calamari I’ve ever had. The Mooloolaba fish market is popular for fresh seafood and take away. You can also eat at The Deck on Parkyn restaurant upstairs. 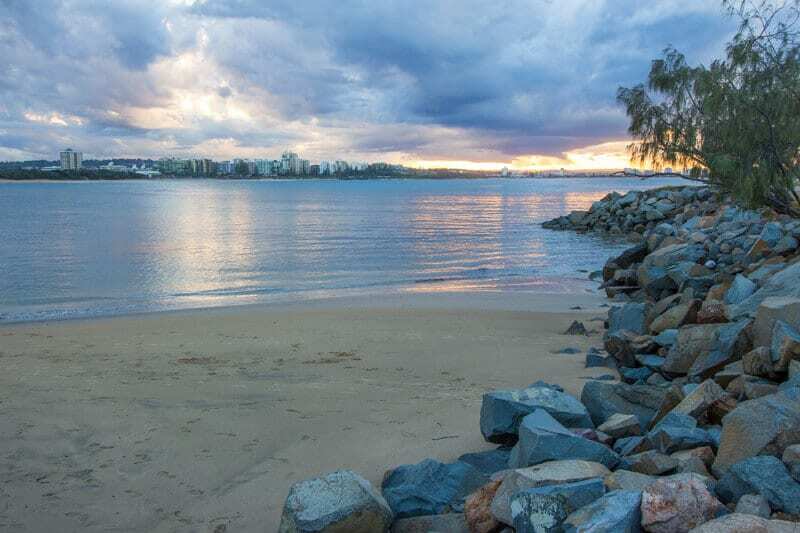 The point is a fantastic place to watch the sunset of an evening over Mooloolaba and a fabulous place to photograph the Mooloolaba cityscape of a morning when the light is soft. If you’re a fisherman, find a spare rock and enjoy a peaceful day of angling. Mooloolaba Wharf looks out over Parrearra Channel and the wealthy homes on Minyama Island. Admire them over a few drinks from the deck of the Wharf Tavern. There are a few restaurants and cafes, shops and ice cream parlours in the vicinity. You can get even closer to the homes and the canals on the fantastic Mooloolaba Canal Tour. We did this when we lived on the Sunshine Coast and loved it (recent reviews on TripAdvisor are glowing!) There are different cruises you can take, the popular one being a sunset cruise. It’s not just about playing in the water, but seeing what lives underneath it. 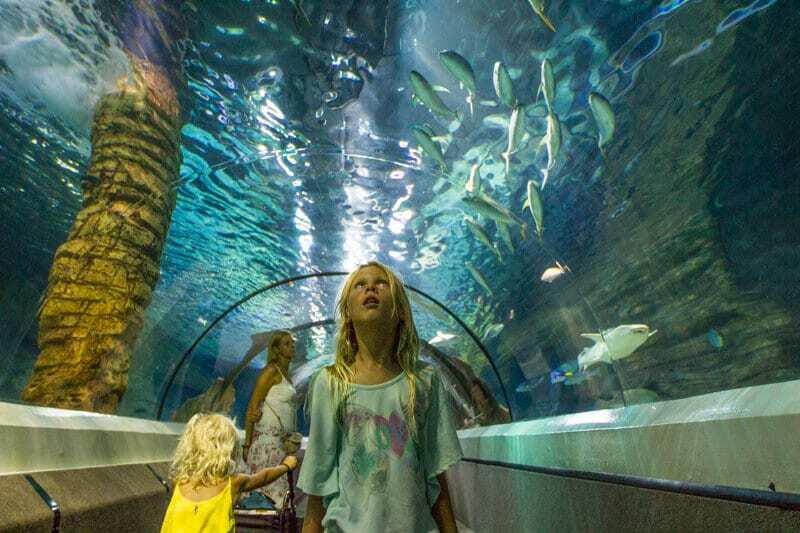 Sea Life at Mooloolaba in the wharf area has recently undergone a major $6.5 million renovation to provide an interactive and engaging experience with the underwater world. 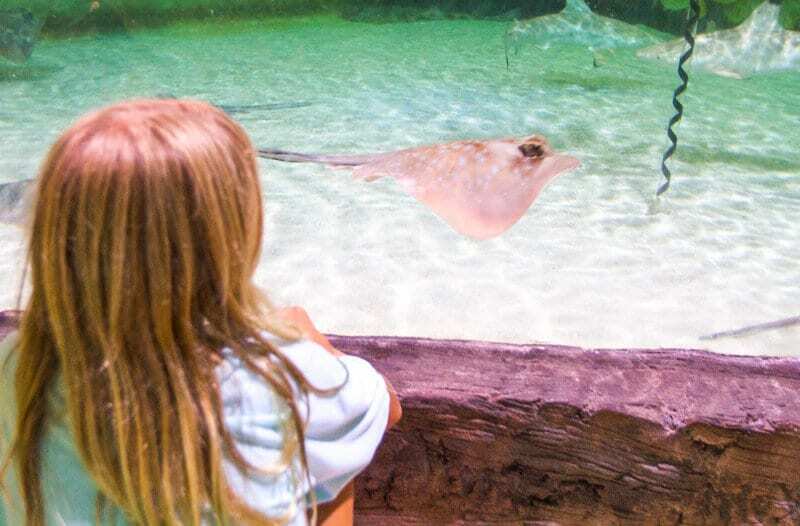 Sea Life is home to thousands of animals, including sharks, seals, turtles, stingrays, and tropical fish. It also is home to Australia’s largest collection of jellyfish! And our kids loved the Octonauts themed room that was playful and educational. 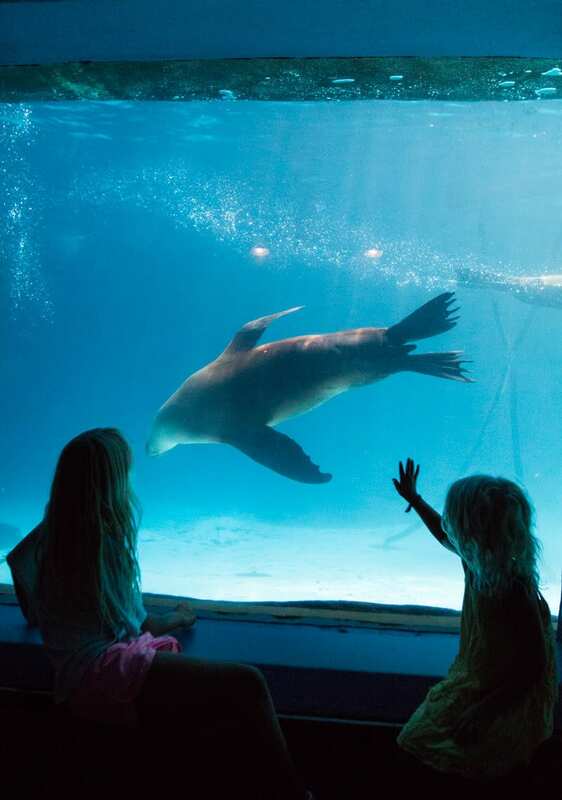 The good news is you can play in the water here – with seals! 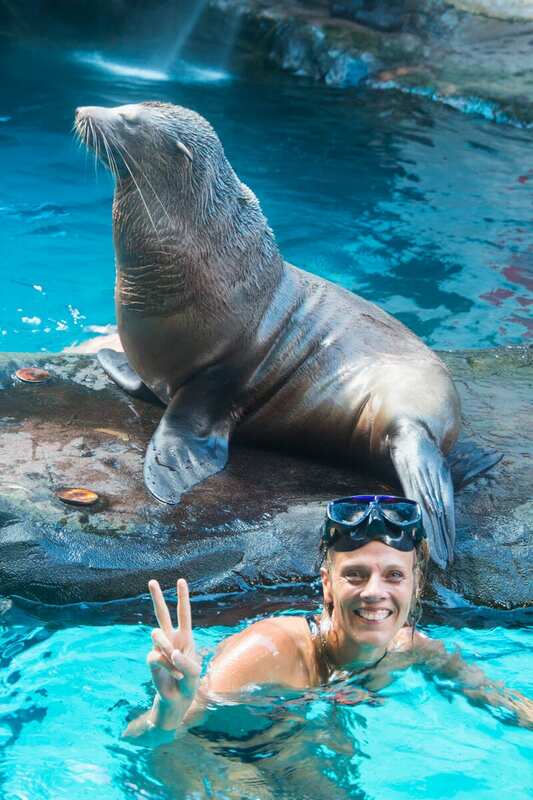 A definite highlight of my visit to the Sunshine Coast was to spend 20 minutes swimming with seals Groucho, Bella and Tico. They are so playful, inquisitive and cute – even when they do grunt at you! I was so close to their adorable faces I was tempted to plant a kiss on their whiskers! 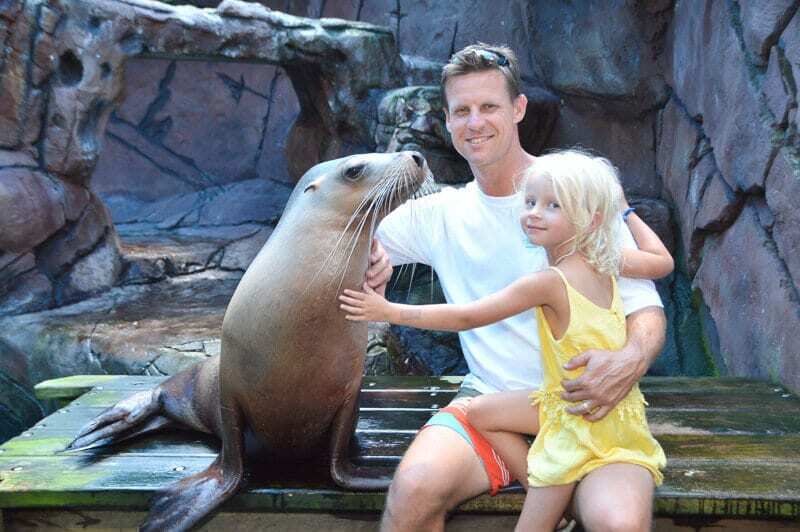 If swimming with seals is not your thing, you can still have an in-depth experience with a seal encounter and sit beside them for a photo and the chance to learn more about them while stroking their fur and shaking flippers. Savannah was a little timid at first, be then loved the experience! There’s also a twice daily seal show, which the girls enjoyed watching. For the brave, and scuba fit, you can even dive with sharks. Watch more Sunshine Coast family adventures on our YouTube video. Click play and don’t forget to subscribe! 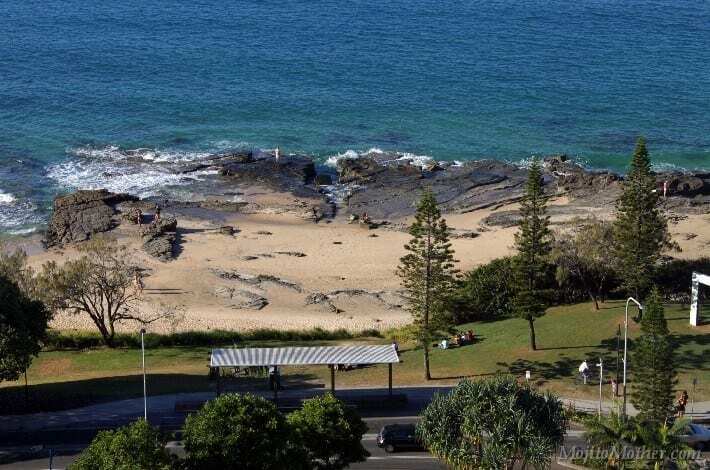 There are plenty of holiday apartments and resorts along the Esplanade in Mooloolaba to choose from. 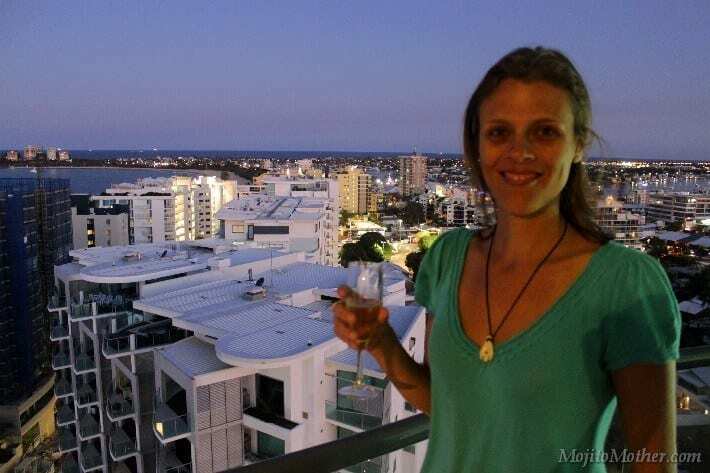 We loved the views from the Mantra apartments at Mooloolaba – overlooking the hinterland and the ocean. Perfect for any time of day. It’s located in the northern part of Mooloolaba Beach and closer to Alex Headland which I love. Get in quick, because the sad news on the street is they are closing down this beachfront caravan park for redevelopment. A small park, but the best location – right next door to the surf club, on the beautiful boardwalk, with a beach access track right in front of it. And across the road from the Waterfront and wharf area. 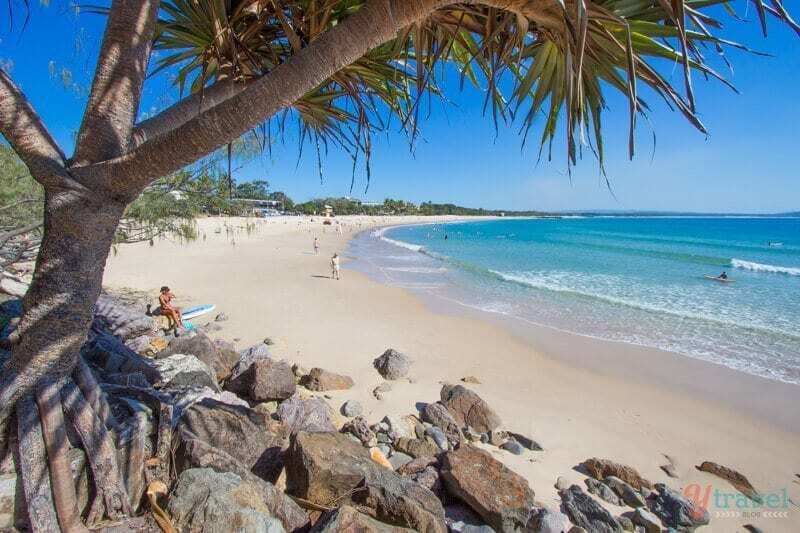 Noosa is one of the most well-known and popular holiday places on the Sunshine Coast and known for a bit of sparkle and uptown flavour. What elevates Noosa to this status for me is the Noosa Heads National Park situated right on the edge of town. 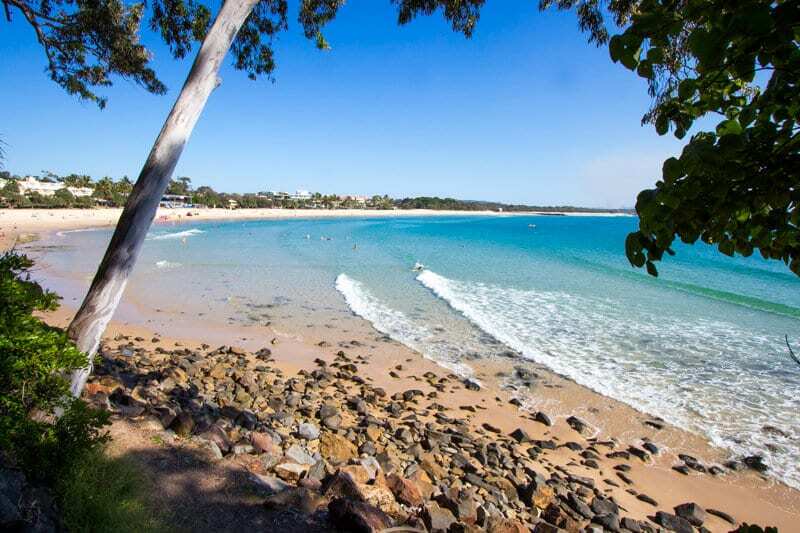 Surrounded by river, beach, hinterland, and national park the Noosa region is quite an incredible place to play. It’s also the start of the Great Beach Drive up to Rainbow Beach and Fraser Island – one of our favourite drives in Australia. 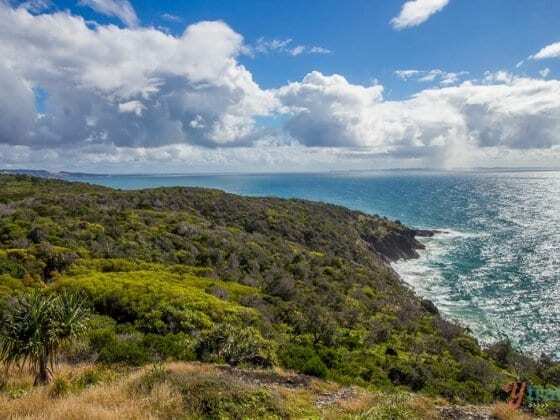 Head out for an early morning walk along the coastal track within the National Park from the surf club to Tea Tree Bay. Stay awhile, enjoy a swim in one of its many hidden beaches with only the odd dedicated surfer carrying in their boards. If you have the stamina, you can make it all the way to Sunshine Beach (5.4km one-way), which is another local’s favourite. Or, you can drive to Sunshine Beach and then walk in from that side. There’s a lookout here and when in season it’s highly likely you’ll spot plenty of frolicking whales migrating. Here’s the other magical thing about Noosa National Park – it’s home of the koala beer. So crane your neck a little and you just might make a rare sighting of one of Australia’s favourite marsupials. With its gentle waves and surf lifesavers, Main Beach is a great spot for the kids to learn to surf, or just for a beach play day. It’s also only steps away from Hastings Beach if Mum (or Dad) want to sneak away for some shopping or coffee. Head to Noosa River mouth at sunset with a few nibblies for an epic colour show! It’s incredible to see how much the Noosaville area has grown since we first lived on the Sunshine Coast. Noosaville is now a bustling place with boutique shops and many multicultural restaurants. It’s only five minutes from Noosa but has a more casual feel. If you can swing a kid-free night, the Noosa Boathouse Restaurant on the river has stunning views and delicious food – you can bring the kids too if you want! The Chef’s signature Beef rib dish was an absolute highlight and would make my Australian top 10 meals. There’s a sunset bar open from 4:30pm Tues to Sunday which would also be an option to end an amazing Noosa Day. Do you want the best smoothie in Australia? This is my HOT tip. 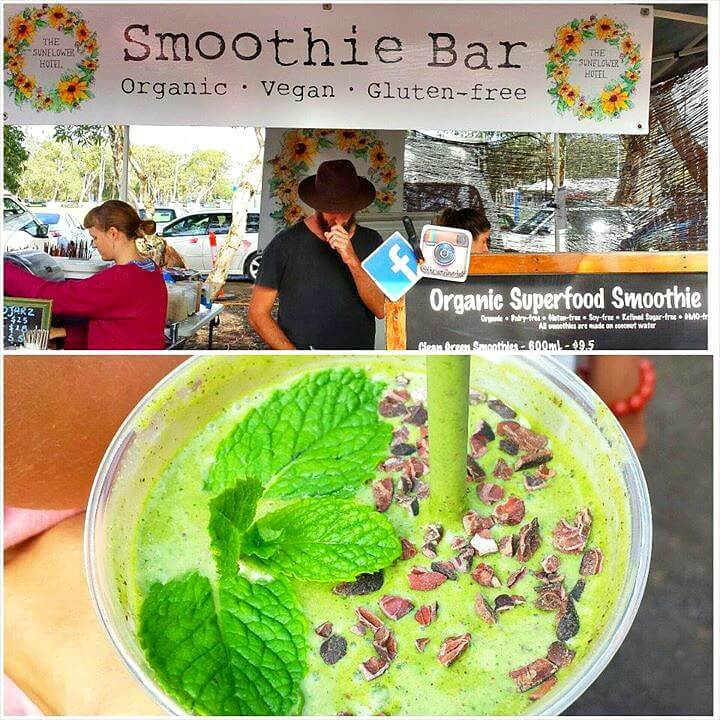 Head to the Noosa Farmers Market on a Sunday morning and head straight to The Sunflower Hotel smoothie & juice bar. Their Mother Earth smoothie is the BEST I’ve ever had – and I have a lot of them – it’s a meal on its own. I can still taste it and would die for one now. The Farmer’s Market has amazing fresh produce and foodie experiences. These are the accommodation experiences we’ve had in Noosa. Although the rooms were a little small, they’re beautifully styled and located on Hastings Street right near the entrance to the beautiful National Park. The Mantra on Hastings also has a great tropical pool area the kids will love. 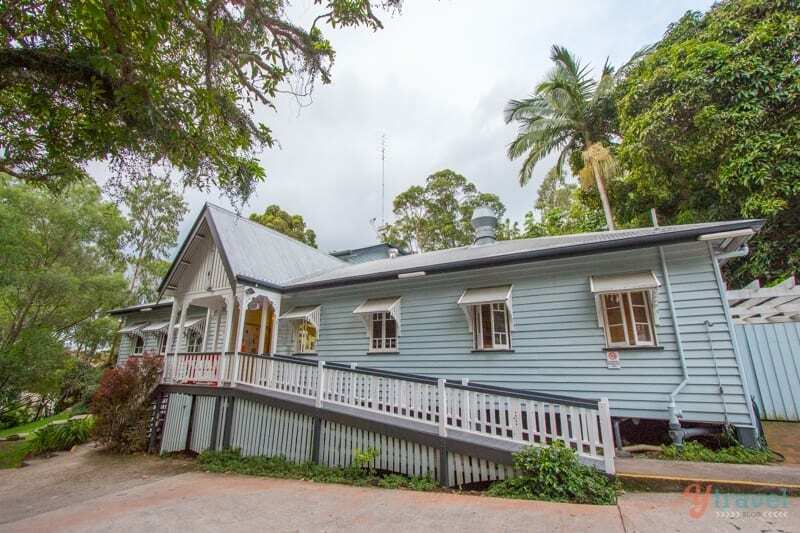 Situated on the hill behind Hastings Street in a beautiful old Queenslander is the Noosa YHA. Even if you aren’t staying here, you can pop up for a cheap meal and sunset drinks on the deck. It has a happy, communal hostel vibe – one of those rare hostels you know create memorable moments and connections with new travellers. It’s probably not your first choice when choosing accommodation in Noosa for kids, but we stayed here in a 4-bed dorm and had a pleasant stay. 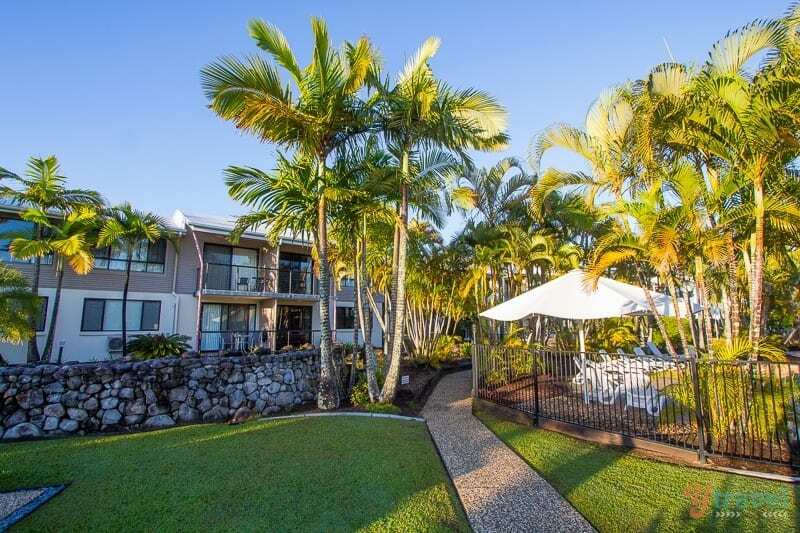 Ivory Palms at Noosaville is right near the foreshore and has a range of modern and comfortable accommodation types from villas to apartments. The facilities for kids include a gated children’s playground, three swimming pools, games rooms, and tennis courts. 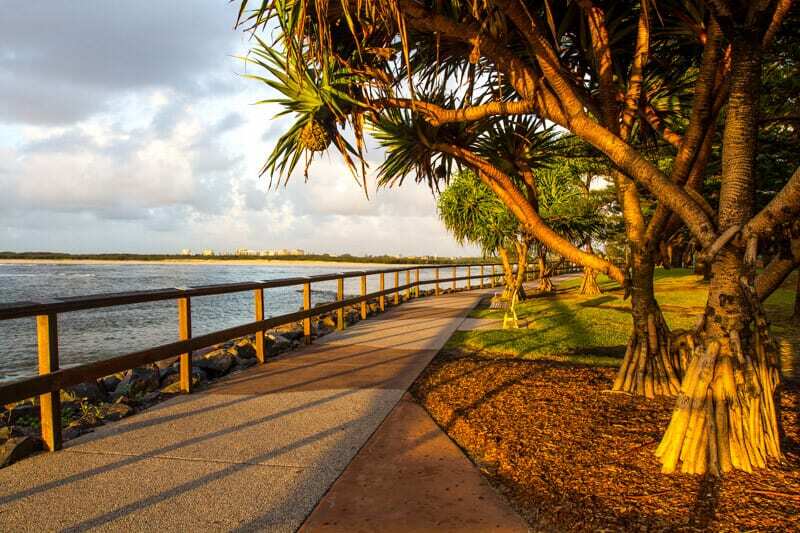 Caloundra sits at the southern end of the Sunshine Coast and has come of age since we lived in the area. We’ve stayed in Caloundra three times in the past year and have enjoyed it, especially what it offers for families and has plenty of beaches to enjoy. Choose your favourite! Stand up paddle boarding (SUP) is a water activity we love to do as a family. Whilst Savannah hasn’t quite embraced it yet she loves to take photos of us doing it. Kalyra is a natural and always keen to jump on a board and what better place to do it than watching the sun rise over Bribie Island and Caloundra on the calm and gentle waters of the Pumicestone Passage at Golden Beach. It sure beats the usual school morning rush hire in our household! These are the moments that affirm travelling with your kids is worth all the sacrifices. Grab a board from the friendly folks at Golden Beach Hire who rent out kayaks as well. 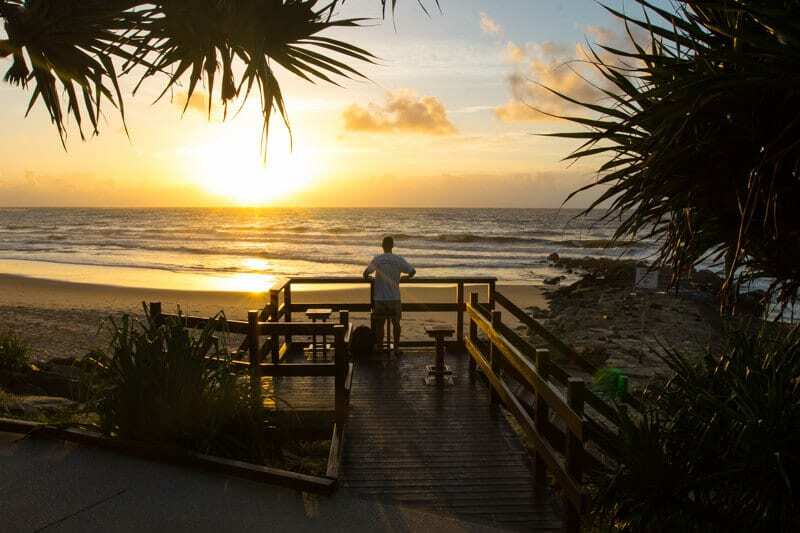 Golden Beach is on the Pumicestone Passage and is sheltered from the wild ocean by the tip of Bribie Island making it lovely and calm – safe for swimming, fishing, boating, windsurfing & kite surfing. 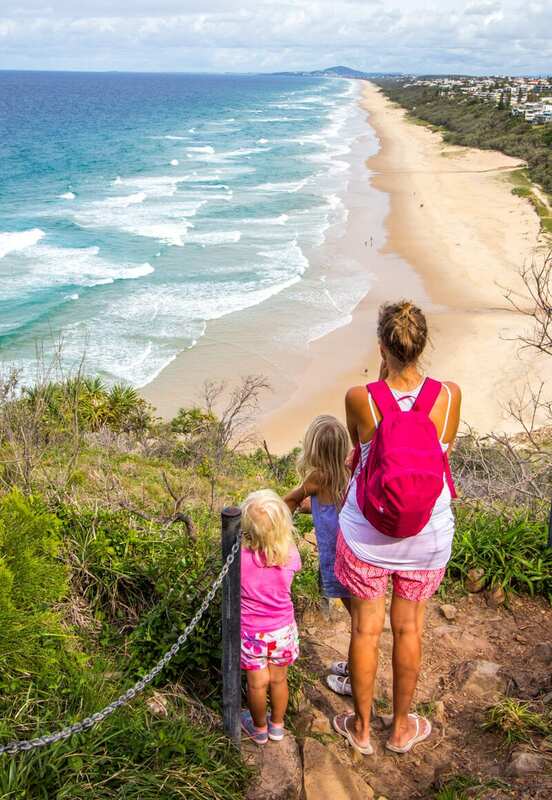 Named by SLS Queensland as the top beach in Queensland and the most family-friendly. Based on various criteria Kings Beach certainly ticks all of those boxes; it’s patrolled 365 days of the year and also ranked extremely highly across other safety categories. It’s a wonderful beach for a quick swim or a relaxing day trip with the family. The highlight of Kings Beach for us was the tidal pools. The views looking out over the ocean was extraordinary and it gives you the warm, salty waters to swim in without the crashing waves. Popular for all ages, and long enough for those wanting to fit a few laps in! Across the road from a strip of cafes and restaurants is Bulcock Beach, popular with families for the warm paddling pools at low tide. There’s a lovely boardwalk along the coastline here and a grassy area at Happy Valley for ball games and picnics. Moffat Beach is not patrolled but does have a protected inlet with a beautiful swimming beach. It’s a popular beach for surfers, and not as well known as the other Caloundra Beaches. When we lived on the Sunshine Coast in 2007 we’d come down here for fish and chips at sunset. There’s also a spectacular coastal walk that leads from Moffat Beach right around to Kings Beach and Bulcock Beach. An insider tip given to me by a local I was chatting to at Kings Pool is that Moffat has some of the best cafes in the Caloundra area. 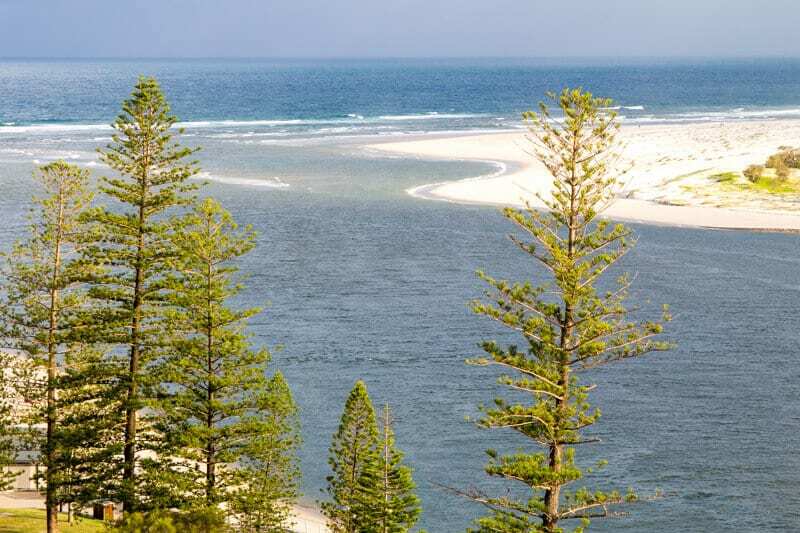 If you’re looking for a quiet beach retreat, away from the crowds yet still close to a bit of action, Currimundi is a small suburb only 5km north of Caloundra. Craig and I rented an Airbnb property for a few days here a couple of months ago to have a work retreat. It was the perfect place for it. 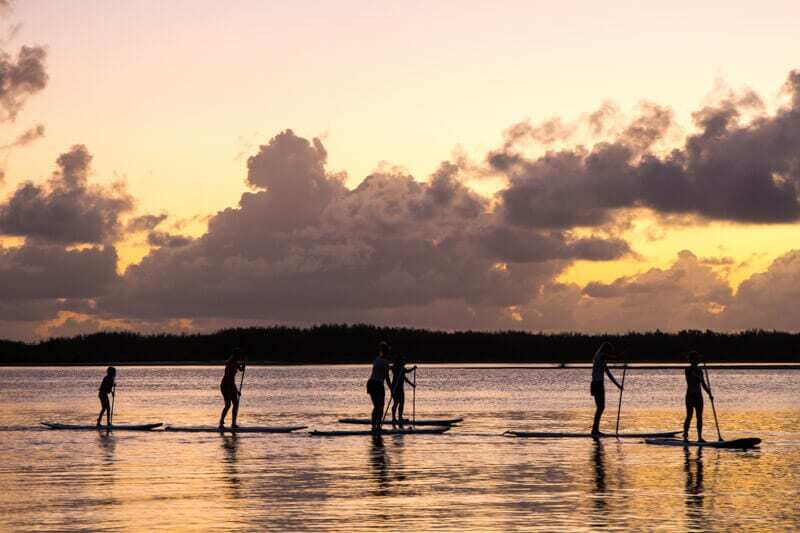 Currimundi Lake has plenty of sandy beaches and calm waters for stand up paddle boarding, kayaking, and safe swimming. At low tide a sandy island forms in the middle for a bit of beach cricket. And the banks are full of shady trees. Walk over the sand dunes and you’re on the beach. It’s a bit more open and wild but is patrolled on weekends and school holidays. Whoa! After writing all that, I’m loving the Sunshine Coast even more now! It’s a fantastic coastal destination, especially with kids and offers so much opportunity to enjoy Mother Nature and her beautiful waterways. I can’t wait to share with you the other side to the Sunshine Coast that I possibly love even more! You can never have enough sunrises! 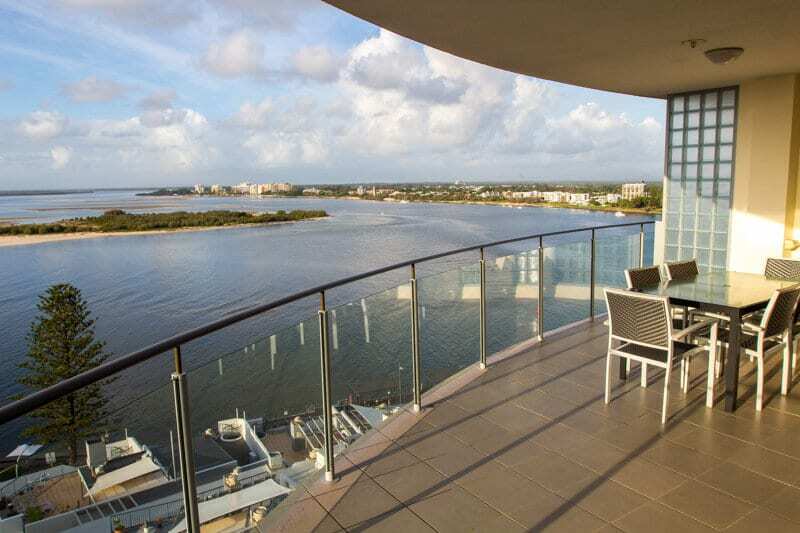 These modern self-contained apartments have the most beautiful views out over Pumicestone Passage, Bribie Island, Bulcock Beach and the river mouth. You’ll be more than happy eating breakfast and sitting quietly with your cup of tea in the afternoon with these views. Monaco Apartments is a fantastic place to stay right in the centre of town with easy walking distance to most places. We didn’t stay at the Oaks Oasis Resort with our kids, we were on a couples getaway for a conference, but one look at the water park told us they’d love it. It has a splash pool, waterslides and fountains and a giant tipping bucket. Pull up a sun lounge while the kids play! 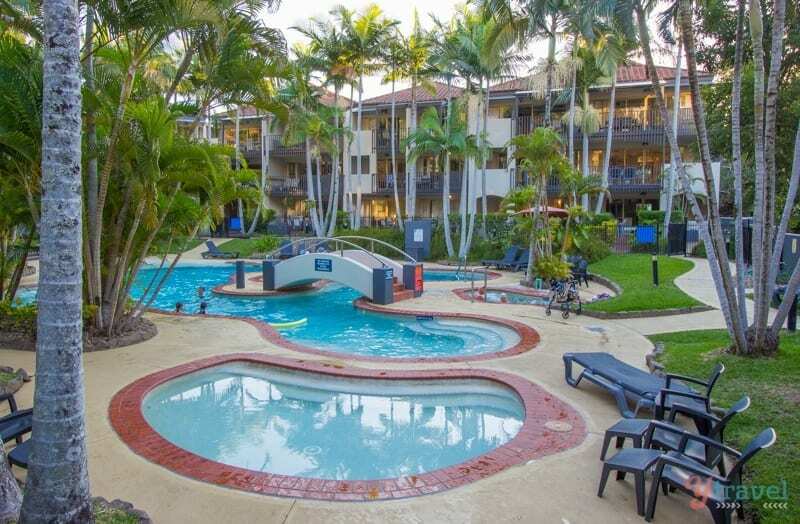 They have hotel style rooms, apartments and villas and are an easy walk to Golden Beach, Bulcock Beach and the centre of town. Our recent stay on the Sunshine Coast was in partnership with Sunshine Coast Tourism. For more info on things to do on the sunny coast click here. Have you visited the Sunshine Coast in Queensland? Share any tips or ask a question in the comments below! Very Nice Articles with Good Images..
Great roundup of the Sunshine Coast. It is one of my favourite places in Australia, mainly because my daughter lives here and we visit often. I never get tired of visiting because there is just so much to the Sunny Coast. The other place I love is Coolum as it is a little less hectic than the other places.